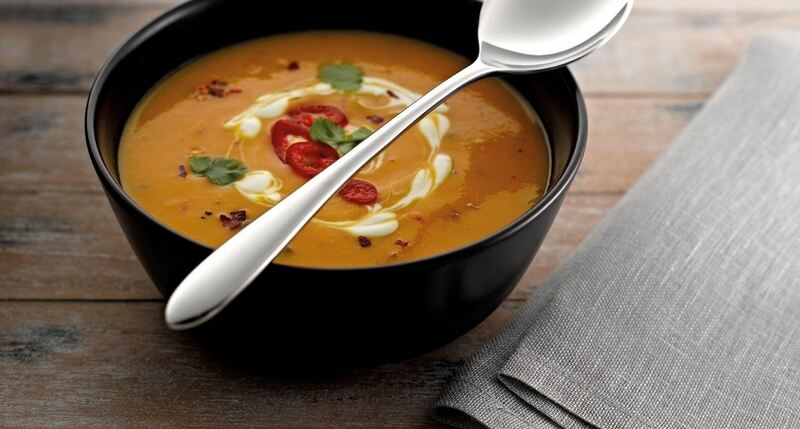 By its very nature, stainless steel is the ideal material for cutlery. Durable and rust resistant with a lasting shine. Don't just save it for special occasions; our cutlery is guaranteed for a minimum of 25 years, so no one has an excuse now for not entertaining at home. Our cutlery can certainly handle itself, (even in the busiest households), but to keep it gleaming we'd recommend following the simple care steps set out here. If you've got the time, then handwashing is the kindest way to treat your cutlery. Put a few pieces of cutlery in the bowl at a time to minimise the risk of the cutlery rubbing against each other and casuing scratches. Avoid scouring pads and bleach detergents, and get someone to help you dry afterwards. Prolonged soaking can corrode knife blades and leave unsightly watermarks. At the end of a lovely meal we're sure you'd rather have another glass of wine than wash up! So, feel free to pop all your cutlery in the dishwasher. It's best to rinse cutlery before putting it in the dishwasher in order to remove any food, as well as any salt or acid that may be contained in particular foods. Steel cutlery and silver plated cutlery should never be mixed in a dishwasher because a chemical reaction between detergent and steel can sometimes leave marks on silver plated cutlery. Just remember to remove your cutlery promptly at the end of the rinse cycle rather than leaving it in a damp environment overnight. At Amefa we don't do silver service, but we do like our cutlery to sparkle. 'Stainless' means stain-resistant rather than it won't stain at all. So, if yours gets a little dull, just give it a polish with a soft cloth. If you do get any stubborn stains, a good quality stainless steel polish should help restore the gleam. Amefa products are manufactured with the utmost care and checked carefully, as well as guaranteeing many years of enjoyment. Corrosion and damage caused by misuse or failure to maintain the cutlery are not covered by the guarantee.